I’ve always loved paisley! It’s such a fun, colorful, and groovy print! And I’m wild about this Black Artisan Paisley print on these new J. Jill Printed Rayon Full-Leg Crops! I just caught a bit of a travel special about Marrakech recently and it gave me some inspiration for this look … the rich colors and patterns, the dangly gold earrings, the straw hat … Has anyone ever been to Morocco? I think I need to go! J. Jill does it again with a July collection full of flattering, high quality, and easy-to-wear pieces. I’m already a big fan of their cropped pants (love these) and this new print is just luscious! Also, I sized down this time around, from a S to a XS, and they still are plenty comfy. J.Jill tends to run large, so I’d suggest going at least one size down. Oh, and won’t this print transition nicely into fall when the time comes?! 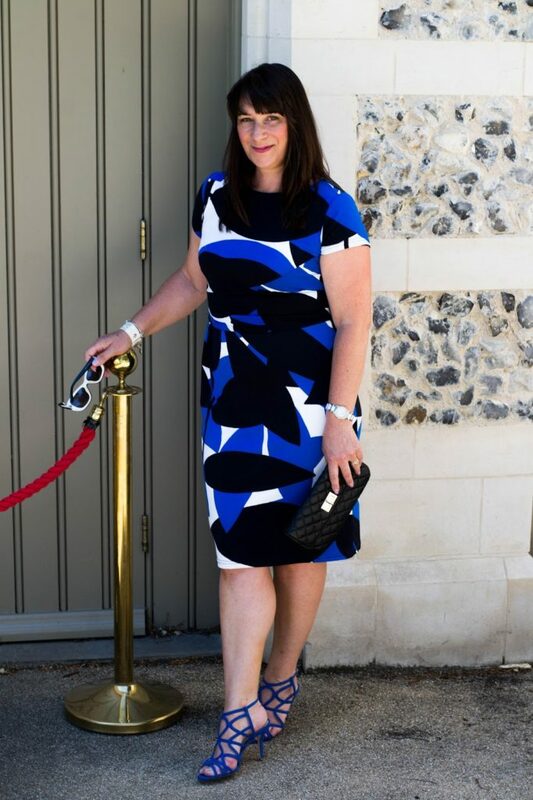 The featured look from last week’s link up is Jacqui of Mummabstylish looking super fabulous in this gorgeous black, white, and cobalt blue dress! Did you catch this J. Jill linen tunic post? And hey Dolls, it’s that time of year when the sales are getting HOT! Don’t forget to sign up for the Fashion Should Be Fun weekly newsletter and get an email from me every Friday with the best sales for the weekend (including discount codes! ), along with some exclusive content! PS Don’t forget to link up! Those pants are fabulous Dawn!! I think J.Jill is really stepping up their game lately, because I love all of their items!! Prettiest pants on the prettiest baby and I love the hat! Have a wonderful weekend sweet friend! Lucky you live in California while I’m up here in Vancouver, dearest Dawn…’cause I’d steal those oh-so-chic paisley pants from you in a second!! ;D And those black Jambu sandals?? Sooo yummy!! These crops are so fun!! You look fantastic. I think that wide-leg crops are a fabulous option to shorts in warmer weather. They offer the ease of a skirt and the comfort of sweats while still being chic and stylish. Thanks for sharing your styling insights and for the link up. Have a great weekend! I love those pants!! And I share your love of paisley! I may need a pair of my own!! Those wide leg crops are so fun for summer! Love this chic look on you! I love those pants. Perfect summer look! Who knew J. Jill had such cute clothes?! Apparently you did! Love how you styled those super cute crop pants! Love the crops and the hat…so fab! I love this outfit on you! Great look! You wear the most fabulous outfits! I don’t think I could pull off those pants but they look great on you! I adore these trousers and the sandals you paired with them! Thanks so much for the link up. I love me a cropped trouser too so these are perfect in my eyes. Love how you’ve channelled your inner Moroccan… love, love, love it all!! That paisley print is so fun! You know I am a sucker for a crop pant too. Love those pants. The paisley is so pretty. You summer style is kicking it out of the park! Peace! You always look like your having so much fun in your pictures! I LOVE the shoes and bag! Such a fun crop pant for the summer! Love the paisley print! I love the print of your crop pants! Those heels look good with pants of that type. Great look! Love the print of your pants and look at that first pic, so glam in the hat! love it. You always wear culottes and palazzo pants so well and always find great things at J. Jill. Love your pants and the edgy sandals with them. Also, all your Kendra pieces are stunning. Fun! Fun! Fun! I love those pants! What a fun look! I love the bright patterned pants! Oh you’re so welcome! You looked so fabulous!! I love those cropped paisley trousers…they’re perfect for showing off those fabulous shoes! I went to Agadir in Morocco a few years ago but to be honest we stayed in the hotel complex most of the time. When we did venture out we hired bicycles and I managed to find a Zara…no surprise there! Wow, these pants are amazing! Wonderful summer style. Thanks for linking up with Fabulous Friday!